I often would think about what accountability looks like and how it feels. I would try to even my odds and right my wrongs, by distancing myself from my mistakes and others. Running from any and everything that felt unsafe. I felt I didn’t have enough placement in my truth. Can you hold yourself and others accountable if you don’t know? How can you grow without question your behavior and others? I urge us to seek accountability for ourselves and others. I urge up to re-write what’s wrong to make it right. Because we are society. We create what’s right and wrong. We place things in places they don’t belong. To resit running from a truth that’s inescapable. It’s too easy to tell people to take responsibility yet not hold them accountable for their actions and reactions. But, there is justice in learning to unlearn conditioned behavior and societal norms. We should’t just hold those we don’t care about accountable. Lots of times the disconnect is that we tend to only want to hold people we don’t connect with accountable. We must hold those who we connect and disconnect with accountable. Everyone should be held accountable. We should be held accountable too. And so should the people who are near and dear to us. We talk about : Loyalty, Loyalty is to protect people we care about. But this doesn’t mean we should coddle them. This doesn’t mean we should banish their wrong doings. Instead? We hold them accountable. Without accountability? the modifications implemented will only somewhat be successful. that’s if even the modifications are successful. it doesn’t feel right to be told you are wrong. Yet remember in order to make it right? You have to be told when you are wrong. Calling out people and holding them accountable isn’t persecuting them. It isn’t an attack either. It could also be looked as protecting them from making the same choices + mistakes. The best way to protect people you care about? Is to correct them. This maybe why many feel one call out is enough. They look at calling out as a form of punishment, rather than to look at it for what it is: accountability. Accountability is not punishment it’s responsibility. Responsibility is not punishment. It’s reinforcement. We all need reinforcement to stay aligned. Accountability is never a one time thing. Being held accountable is constant. Accountability impacts and ENHANCES a person. We are not accountable for others actions however we are accountable for calling them out about their actions. Their actions aren’t our actions yet our reactions can help them from acting / behaving that way again. Often times we see people we know/ look up to/ love/ respect get called out for their wrong doings. So lots of our coping mechanisms is run to defend them. We feel at peace when the people we connect with are loved and well protected. it’s a momentary psychological relief. So defending them? should’t always the first response we give. Especially when that person has harmed someone else. Accountability is what we should give. Unacceptability to that behavior is what we should give. When we rush to defend people? We provide them power when we rush to their aid. pushing them to what they should’t do ; watch in silence.Then their fans, friends, etc began to do the work for them. They become a bystander to their own responsibility. Silence is not the correct placement when you have wronged others. Own it is. Be accountable? Is. Then? Sometimes an apology is given. It’s important to remember an apology isn’t going to be met with forgiveness. Forgiveness shouldn’t be the first thing the person apologizing is expecting. 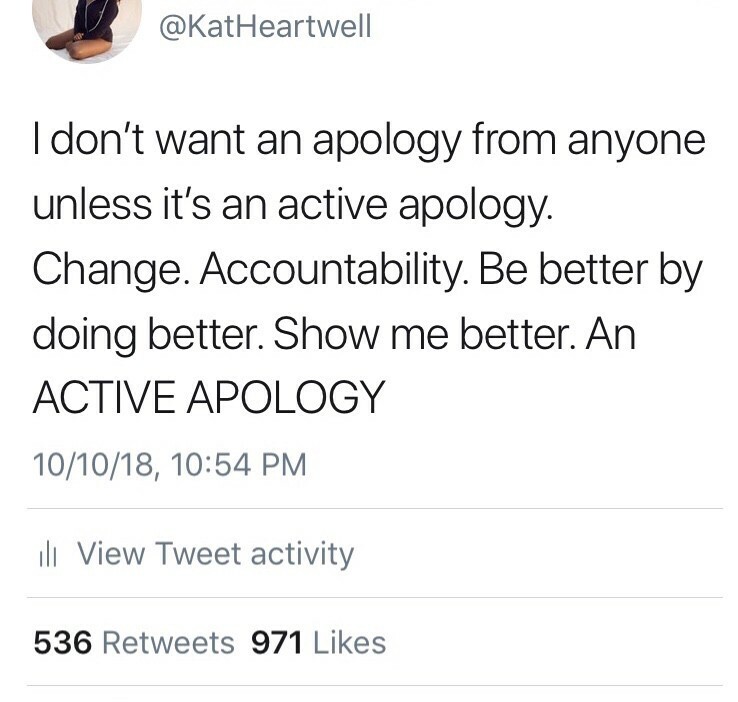 The best apology is an active apology. Which means working at and on your accountability. Sometimes someone can be forgiven. Lots of times forgiveness may never be granted. Do not let forgiveness be the main motivator when giving an apology. It’s not about being forgiven. It’s about making sure the person you have wronged healing. You should seek healing too. By working on yourself. By making sure the people in your life hold you accountable. In order for the people in your life to hold you accountable? You have to make space and a place to be corrected. Remember not to project your anger with your self onto those who are correcting you. It is also important to make sure you hold YOU accountable. It’s important to make sure the people you hold accountable know what they did wrong. Its also important to let them know what they did right and how they can work to make sure they don’t make the same or similar CHOICES. I encourage myself and others to take our own blame and look within rather than projecting it on and into others. I confront what I am being called out for. I make sure I don’t deflect. I respect myself and others boundaries by listening so I can learn and love better. So I can do better by being better. Writer. Evening my odds. Sociology. Mental health.